Last month, Instagram introduced IGTV, a longform video hub largely positioned by the media as the anti-YouTube. While the two tech heavyweights have long been locked in a race for attention span, their success isn’t mutually exclusive. Instagram’s hybrid offering—at once in-app integration and standalone product—operates within the self-imposed limits of verticality. Some users will leap forward, others might step back. 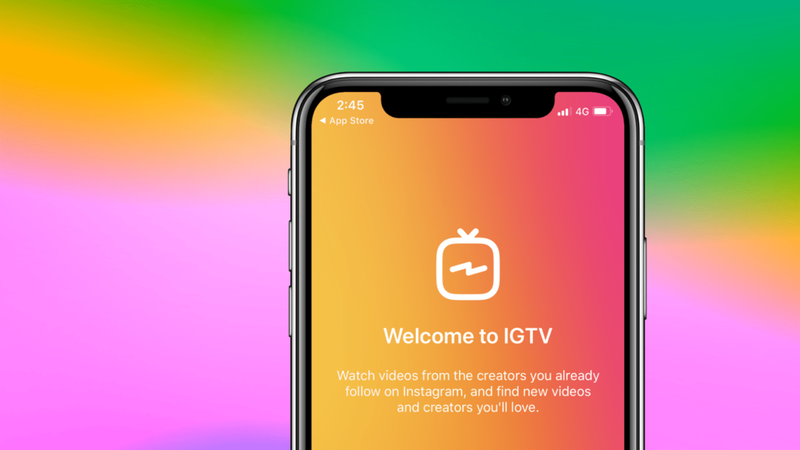 If IGTV boasts any immediate value-adds, it’s facilitated conversion and streamlined distribution. Instagram’s built-in audience all but ensures at least a moderate mix of both. For starters, usage stats continue to balloon, partly thanks to the rapid adoption of Stories. The average 25-year-old clocks 24 minutes per day on Instagram, and 72 percent of stateside teens regularly tap that unmistakable purple icon. IGTV’s sell, then, is a logical one: Why leave one app to watch an in-depth artist interview when you can stick around and enjoy it all the same? That ease of use we’ve come to expect extends to uploads. It only takes eight actions to upload a video to IGTV on iOS. Additionally, horizontal aspect ratios—set in stone since the 1930s—have gradually faded across social media. Indeed, the world goes vertical when there’s a smartphone in hand. (The typical device spends 94 percent of its life upright.) The ability to film with minimal effort will only accelerate the ongoing shift. With that said, SnapChat and Instagram don’t have to exile longtime standards, still alive and well across movies and TV, Netflix and YouTube, to succeed. What they’ve already done is more than enough: Surpass a tipping point that makes ignoring them a mistake. Suffice to say, the creative community will ultimately determine IGTV’s cultural impact. Dylan is starting to use the new IGTV update by showcasing the full clip of his “Clockwise” live in studio performance version. Check his profile. It can take different methods to capture that deeper look. Individuals and brands are actively learning how to produce hi-res content for vertical. In an interview with Nieman Lab, Mashable creative director Jeff Petriello pointed to 4K cameras as the best solution, praising the technology for top-tier quality that’s easily cropped. Many pros will rely on editing software such as Final Cut, Premiere, or even iMovie. Many more have already turned to the 10-plus megapixels available for use on the back of their phones. Some have yet to do either. Early adoption of IGTV (emphasis on “early”) has been somewhat limited as of this writing. Many major brands (Apple, Supreme, Google), artists (Rihanna, Drake, Kendrick Lamar, Beyonce), and influencer channels (Complex, No Jumper, Cole Bennett, COLORS) have, for now, held off on activation, while others (Netflix, Spotify and Genius among them) take a headstart. Few notable music channels already feature original content native to IGTV. Some have repurposed published work, applying a vertical crop. Others, like Jaden Smith, have debuted new material on the platform that rejects vertical format. (You can still watch horizontal videos on IGTV, but no in-app controls will follow your lead.) Movie trailers, recycled memes, life-hack compilations, exercise tutorials and personal vlogs abound. An example of how Genius is starting to migrate its content over to also being hosting on IGTV. Check their profile. Parent company Facebook’s robust ad manager and major label permissions hint at a solution around the corner. Preroll, midroll and sponsored placement adverts seem probable down the line. Ideally, however, ad revenue would source back to the direct uploader. Instagram aims to “use longer, permanent video for deeper storytelling.” If IGTV works, advertising dollars will overflow, and some of those funds should empty into the pockets of artists. Until then, this new digital frontier, boom or bust, is a worthwhile testing ground, complementary to the more refined material you’d expect to find on an artist’s YouTube channel. Subscribe to and Join our Punk Aristocrats Community and stay up to speed on the latest news in music, digital, and marketing, curated for the next generation of artists and managers.